This is the first ethnographic study of the farmers and foragers of northeastern Zaire since Colin Turnbull's classic works of the 1960s. 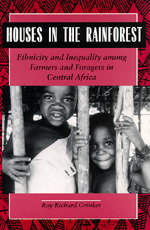 Roy Richard Grinker lived for nearly two years among the Lese farmers and their long-term partners, the Efe (Pygmies), learned their languages, and gained unique insights into their complex social relations and ethnic identities. By showing how political organization is structured by ethnic and gender relations in the Lese house, Grinker challenges previous views of the Lese and Efe and other farmer-forager societies, as well as the conventional anthropological boundary between domestic and political contexts. Roy Richard Grinker is Assistant Professor of Anthropology and International Affairs at George Washington University.